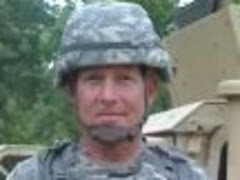 Inspired by President Obama's message of change, hope, sacrifice and service, a 43-year old corporate professional joined the Army to serve in Afghanistan. After a one-year tour in Tarin Kowt, AFG he re-enlisted to deploy again; this time to Bagram, AFG. Here are his thoughts and observations on this second deployment. It was just before 0100 and we were changing shifts at the Supply Support Activity; me, Specialist Andropopulus, Sergeant Domino and Sergeant Ack were relieving the other team and beginning our 12-hour shift. We had just settled-in and begun the computer back-up process when we heard a loud, deep and resounding “BOOM”. 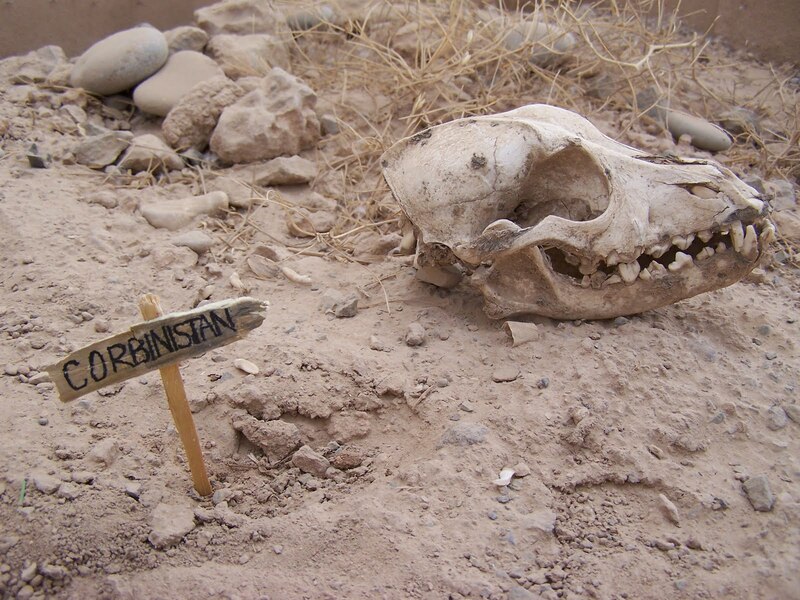 It had been some time since there had been any kind of attack, and never this close to our area of operations, so we all looked at each other with wide-eyes for just a moment before reacting. “That was fricking close!” Andropopulus cried out. “Shut up and get your gear on,” SGT Ack yelled back as he joined me and SGT Domino at the rifle rack where we were already locking and loading. The thudding booms were getting closer and we could feel the earth trembling from each impact – dust was drifting down from the creases of the tent’s ceiling and the lights began to flicker. I just shook my head and finished gearing-up; he might talk junk, but I knew we could count on SGT Domino when it mattered. “Oh man, it is right out there,” Andro moaned, white knuckles gripped around his M4. We burst out of the tent with Andro and SGT Domino cutting left and me leading SGT Ack to the right. I almost stumbled when I saw it – the biggest tyrannosaurus rex ever. It had to be at least 20 feet tall, its teeth were as long as broom handles, and it was heading straight toward Andro and SGT Domino with its stubby arms thrust out, its long tail swinging countermeasure to its thundering footsteps with its head cocked like a giant robin about to peck at a worm. Geeze, I thought, it is going to get them. I began firing at the dino’s head, trying to hit the eyes – the one weak spot not covered in thick, Kevlar-like scaly hide. SGT Domino was focused on getting to a shipping container for cover and didn’t even see it coming; the t-rex bent down and snatched him up between his jaws and with a bite and two gulps, SGT Domino was gone. Part of me recognized the sound of the Apache helicopter coming in, but I knew it was still too far to do anything and I looked for SGT Ack who had some how disappeared. I didn’t have time to wonder where he was since the t-rex was now stomping towards Andro, bellowing in rage and hunger. “Run Andro, run!”, I yelled as I went full auto, trying to get the t-rex to turn away. 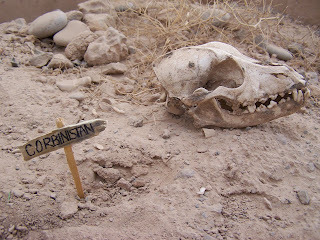 The t-rex got to him in three steps and bit Andro in half – his legs fell to the ground twitching. The whump-whump-whump of the Apache was getting real loud and just as I turned around to look for it, the pilot launched a Hellfire missile, but it missed and only blew a HUMV-sized hole in the ground next to the t-rex, which only seemed to make it madder. I was out of ammo and was grabbing in my cargo pocket for my extra clip when SGT Ack came blasting out of the storage yard on the 10-ton forklift. “YEAHHHH! Take that, take that!”, SGT Ack screamed as he rammed the forks under the t-rex and began lifting. The dino was roaring loudly in frustration as it’s back legs were quickly lifted off the ground and only its thick tail was keeping it from falling over when the Apache fired another Hellfire that, this time, was right on target. The t-rex’s head evaporated in a mist of red and green gibbets. Its tail went into death-mode spasms and knocked the 10K, with SGT Ack, over like a Tonka truck, but it was not a hard hit and I was pretty sure SGT Ack was okay; not like poor SGT Domino and Andro. The Apache was hovering directly overhead like it was going to land on top of me and all I could hear was it getting louder and louder: WHUMP-WHUMP-WHUMP!!! I jerked awake and sat-up in my sleeping bag. I stumbled out of my bed and went to answer my door. The above was just a dream of mine and fiction. Names, character, places and incidents either are products of my imagination or a used fictitiously. Any resemblance to actual events, locales or persons, living or dead, is entirely coincidental; although still pretty funny, to me. We have not received mail for several weeks now, but a big shipment came in today so tomorrow when I go on shift I should receive anything sent from the beginning of the month - I will shout out thanks next post. The day after the Berlin Wall came down in mid-November of 1989, I was on a plane traveling from San Francisco to Korea for a one-year tour. I ended up stationed in Seoul and got the opportunity to explore that city as well as major cities like Osan and Pusan, and a few smaller villages when traveling. It was my first time in Asia and I had the chance to see a completely different culture up front and personal. I think any Soldier who spends a tour in Korea leaves with some strong feelings and unforgettable experiences, both good and bad. For me, one of the good ones was having “in-house” boot-polishing and laundry services in the barracks. Twenty-bucks got you a month’s worth of clothes/uniforms washed – with everything from BDUs to blue jeans to boxers being ironed – and your black leather boots being highly-shined – not quite a spit-shine, but a very nice high glow. In the morning you left your laundry bag with your boots by your door and when you returned in the evening, the boots where shining and the clothes were hanging on the door knob – with socks, tshirts and the like, neatly folded and stacked on the squared laundry bag. The services were provided by an older Korean couple (I almost said elderly, but they were not that much older than I am now – to a 23 year-old, they seemed elderly). Odeeshi (Uncle, but used as Mister) and Oshima (Mrs) arrived at the barracks around 0800 and spent the whole day in the 1st floor laundry room; Odeeshi polishing the boots and Oshima doing the laundry. I despise doing laundry. I think it was a John Hughes film in the ‘80s where one of the angst-filled teenagers (one of the Brat pack, I am sure) leaves a classroom dragging her fingernails across the chalkboard in a dentist-drill, ear-piercing shriek. That sound is what I hear in my brain when I think about having to do laundry. 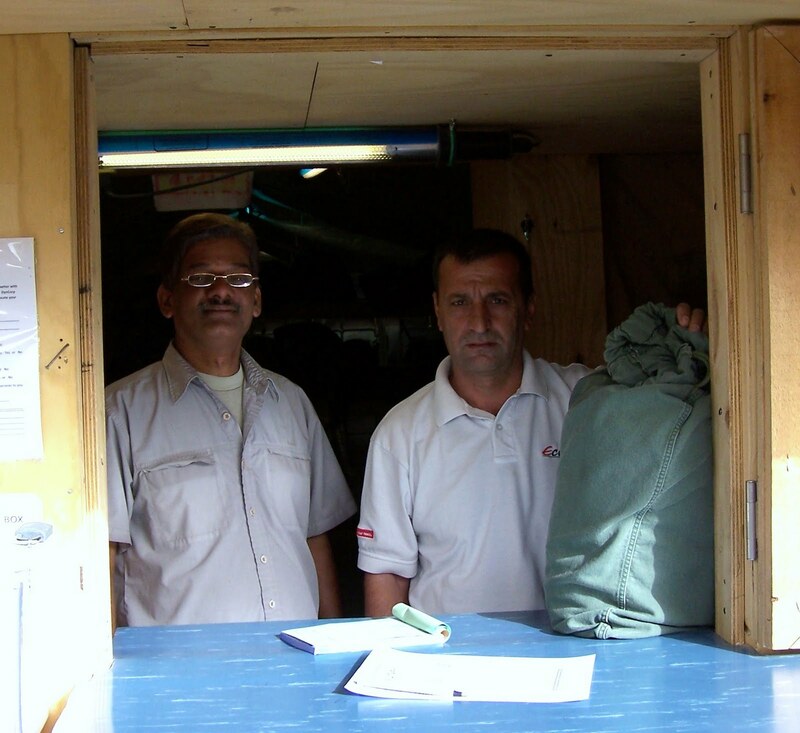 But here in TK, we do not have to do laundry - instead of Odeeshi and Oshima, we have Mr. Guntka (on the left), Mr. Hismani (on the right), and their co-workers who provide next-day washing services. 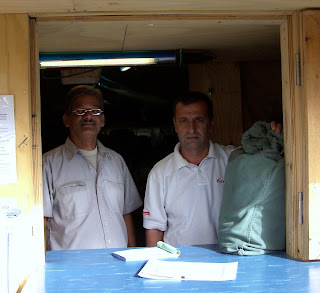 Although you have to actually walk to their shop to drop-off and pick-up the laundry instead of door-side delivery, they fold the clothes nicely, put them in a plastic bag (that serves very nicely as a trash bag for your room) and then put it in your laundry bag for a very convenient package and great service. It makes sound logistical sense to centralize the laundry services with all the machines and corresponding electrical/water/drainage located in one spot instead of having separate facilities in each block of the RLBs. No need for Soldiers to stock laundry sundries such as soap, bleach, etc. Soldiers are freed from spending precious personal time on doing laundry - which might otherwise get delayed until every sock and pair of boxers had been worn and there was only one t-shirt left. I know for myself, as someone who is completely clothing-ablutophobic, I really appreciate how it is set-up so any day can easily be laundry day. Thank you to SGT Mack for letting me (constantly) use his camera. Adrie Kovic rocks for spreading the word about Corbinistan; she blogs as well and agrees we must be complete egomaniacs. After about four months in TK, when I stand on the balcony/cat walk outside my second-level unit to watch the distant sun settle behind the western horizon's mountain fringe, in front of me the potpourri of wooden shacks, tents of various shapes and sizes, and concrete barriers fits easily in my mind's eye with each structure’s place and purpose now well known to me. But in my first days and weeks here, the jumbled landscape of various buildings and tents took some time to get to know and assimilate into my consciousness as home and the neighborhood. During the early evening of one our first weekends here, after the sun had set – which means a certain darkness had fallen as there are not many outdoor lights, I noticed an open area under some tent canopies where it seemed a group of guys were meeting for what looked suspiciously to me like a nice sized poker game. I was instantly interested and thought about strolling over to see about getting into the game, but after a moment or two of observation and reflection – I thought it might be better to check it out later as it looked like they had too many people already and, it could have been just a one-time event as some kind of farewell party since, as we were arriving, those we were relieving were leaving. The next day, my neighbor, who was leaving, told me that group was a bunch of Air Force guys who got together to play poker with the Australians from Kamp Holland. I thought to myself, "Self, what the heck are Air Force guys doing here?" After joining the Club for Propogation of International Cultural Exchange, I found out through conversations over Hold'm Poker the Air Force guys are doing quite a bit here; almost without exception, all the plywood constructed buildings have been built by them as well as a lot of work on roads and construction in general. 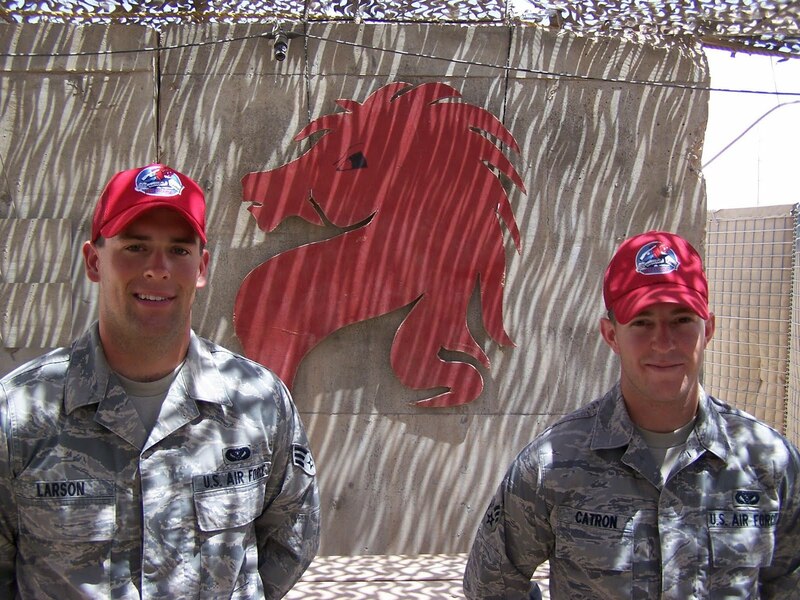 In specific, they are Rapid Engineering Deployable Heavy Operational Repair Squadron Engineer (RED HORSE). In general, basically a squadron of Bob the Builders. And building is what they are good at. During my first few weeks here a brand new chapel was completed by RED HORSE so services could be held in air conditioned comfort versus a dark and hot tent. At this moment, members of the RED HORSE team are putting the finishing touches on a new Medical Clinic building to replace another hot tent. 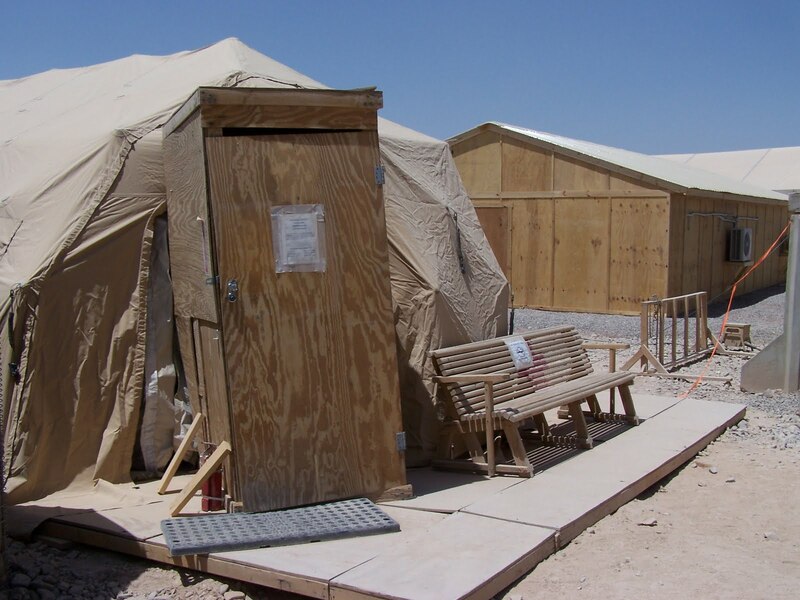 The picture above shows the current Medical tent on the left – the wooden door/frame is so the medical supplies may be secured – with the new building on the right – note the mounted A/C units for chilling medics and patients; a vast difference in comfort and utility. The utilities, insulation and just about everything else relating to constructing the building was done almost completely by two of my poker buddies, Senior Airmen Brad Catron and Kenny Larson. 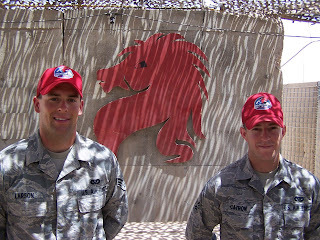 SRA Larson is on the left and SRA Catron is on the right with the RED HORSE logo between the two of them. Larson is from my home State of Utah and his family lives just a few miles from my parents. Catron has been here for nearly a year and will soon be returning home to Wyoming. The two of them are Reservists/Air Guard and will go back to civilian life (they are both in college) once their respective deployment tour is completed. One of the Task Force No Mercy Army Officers made a comment to me the other day about how whenever he sees members of the RED HORSE team working, how they seem to him to be so happy and satisfied in doing their jobs. I never asked my buddies if they were happy, but I do think they should be proud of their accomplishments and hard efforts in supporting the mission and the people who work, worship and tend wounded in buildings built by RED HORSE. Thank you to Donna D. from Milton for the wonderful Care Packages; they were of such a great variety of munchables, which were partially inhaled by the guys on my shift. Thank you to the Red, White & Bike group at St. Agatha Academy in Winchester; please tell the kids I really liked their letters and may I please post the drawing of the “Smiling Soldier” Lauren sent? And, thanks to my Mom for a nice Care Package of toiletries and hygenics; the best part was the MET-RX Colossal bars! Since, as far as I know, the only country that celebrates Thanksgiving is the United States, I have always considered it to be the truly unique American holiday. But, for sheer exuberance, I don’t think anyone will argue that the Fourth of July, our Independence Day, is the epitome of American celebration. Here at TK, we had our 4OJ celebration this year on Saturday, the 3rd of July. I am not sure why it was a day early, but if I were to speculate, it could have been there might have been concerns about the bad guys doing something – since they seem to have calendars as well, or it might have been to avoid a conflict with Sunday worship and the 4OJ celebration activities. In any case, the activities began at 0500 on Saturday with a 5K (about three miles) and 10K (about 6 miles) Fun Run/Walk. Since I usually run the 5K route a couple times a week for PT, I wanted a challenge and signed up for the 10K run. For the first 160-odd people who signed up, or was a volunteer/”encourager”, there were free t-shirts commemorating the event. One of the reasons I signed up for the event, even though I had full 12-hour duty shift ahead of me after the run, was so I could get a t-shirt as a remembrance. The shirts were handed out the morning of the run/walk during registration. After registration and a safety brief, it was ready-set-go at 0600. 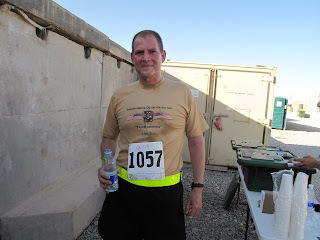 I thought I would be the oldest guy running, but I found out there was one other person a year older than me so we ran together and kept a pretty steady pace of around 8-minute miles with a total time of just over 49 minutes – not too shabby for a couple of guys in their mid-forties at 4,300 feet altitude. At the end, there were prizes for the female and male (not by age categories or I would have certainly have won a prize even if I probably would have had to “accidentally” trip my running partner) who came in first place for the run and walk in both distances. One Soldier was so quick he got to the turn-around point before the race officials were there to show him the way. He got a special prize for going 5.5 clicks, and to the laughter of the crowd, was ordered by the Command Sergeant Major to report to him later for failure to follow directions. After the race everyone went in different directions; some to breakfast and most to showers. I cleaned-up and headed to work. Although I was able to leave shortly thereafter to participate in the next activity: volley ball competition. The natural TK environment, where gravel/rocks have not been place, consists of “moon dust”, which is perfect for volleyball, although it is so fine (talcum powder consistency) it makes its way through almost any shoe fiber to turn socks and toes ochre brown. My black PT shorts got a bit of a dusting when I dove for one ball (that made it over the net, but not in bounds – doggone it!) so the picture above is me just as the first game began. 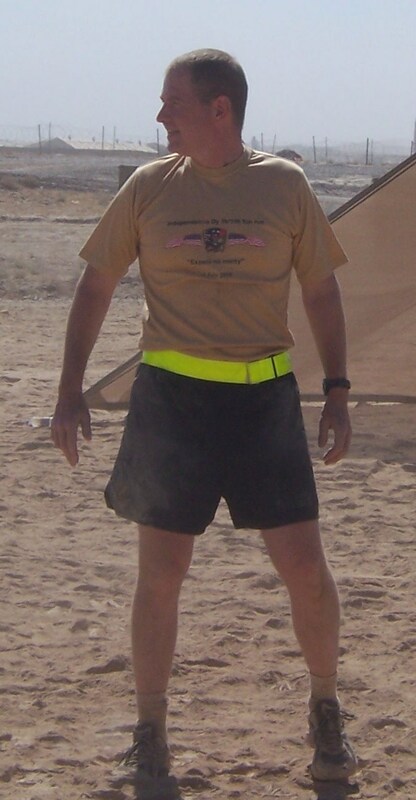 (I crop out other Soldiers as I do not think it appropriate to post their pics without specific approval). My team won the first game, but lost the next match so we came in second to bring our Company 15-points to be tallied together with the points from the events of the day such as horseshoes, basketball, and the ever popular 4OJ activity, litter-carry – where a Soldier lays down on a canvas medical litter and is carried by four other soldiers over a set distance. My Company went the whole distance and was announced as the overall winner during the outdoor dinner meal of grilled steak, hamburgers, mongo-hotdogs, and chicken served with potato salad and baked beans. The ice cream and cake was served at the mess hall (pardon me, dining facility) so the only thing really missing was fireworks, but considering our location, that is something for which we probably all should be giving Thanks.